County Judge Steve Floyd Swears in Justice of the Peace Fred Buck. Yantis Green Photo. Justice of the Peace John McGuire Swears in Justice of the Peace Susan Werner. Yantis Green Photo. District Judge Jay Weatherby Swears in County Court-At-Law Judge Ben Nolen. Yantis Green Photo. SAN ANGELO, TX -- Several local officer holders who were elected in the November general election were sworn in New Years Day in the Tom Green County Commissioners Court meeting room in the Keyes Building. All the officials elected to office are Republicans and will serve four year terms. There were three contested races in the 2018 election cycle. Pct. 1 Justice of the Peace Susan Werner defeated Democrat Sally Ayana in the November general election. Pct. 2 Justice of the Peace John McGuire swore in Werner. Sammy Farmer out polled Tana Sue Pyssen for Tom Green County Commissioner Pct. 2 in the March Republican Primary. He was uncontested in the general elected. Farmer replaces Aubrey DeCordova who retired. Newly appointed 51st District Judge Carmen Dusek swore in Tom Green County Clerk Liz McGill. District Clerk Sheri Woodfin was sworn in by District Judge Jay Weatherby who also swore in County Court-At-Law Judge Ben Nolen. Pct. 3 Justice of the Peace Fred Buck swore in County Judge Steve Floyd then Judge Floyd swore in Justice Buck. Judge Floyd also sworn in Sammy Farmer. Pct. 4 County Commissioner Bill Ford was challenged by last minute write in candidate Gilbert Gallegos. Ford won reelection with almost 90 percent of the votes cast. Senior District Judge Barbara Walther swore in Ford. Pct. 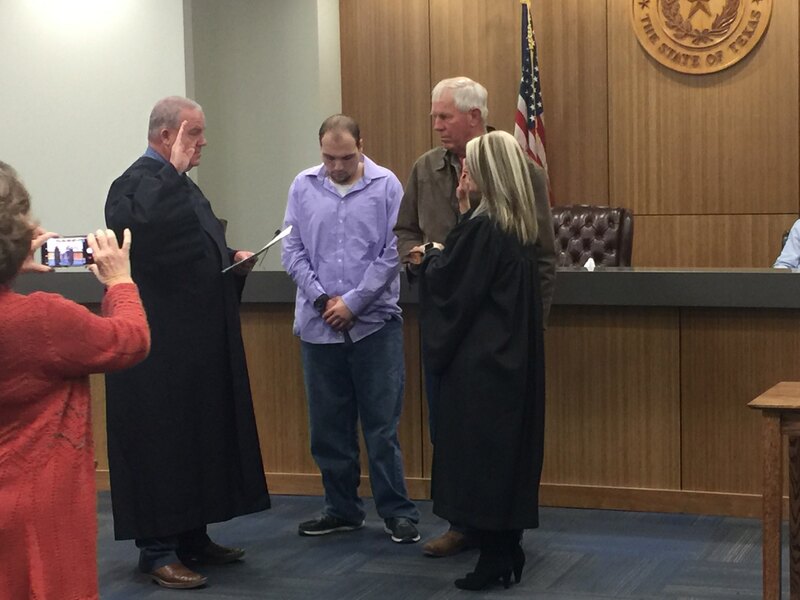 1 Justice of the Peace Susan Werner swore in Pct. 2 Justice of the Peace John McGuire. The November general election solidified the Republican party hold on local elections. Every elected official in Tom Green County government is a Republican.